Could This Macrame Hanger DIY Be Used for Smaller Jewelry Designs? Inspiration can come from many places. Sometimes one craft inspires another. 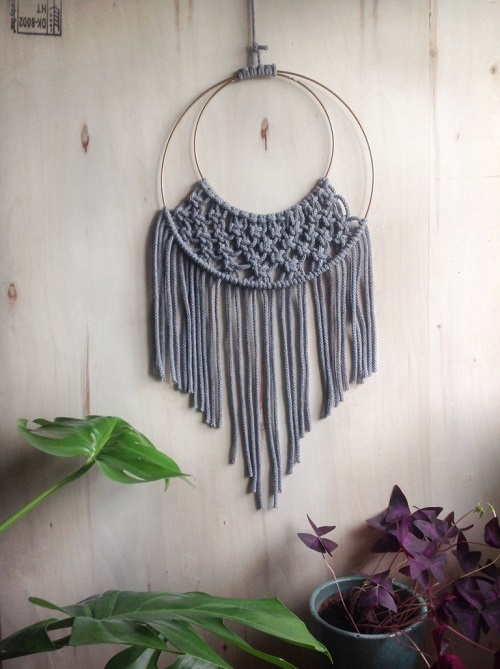 Take this macrame hanger DIY by Ludorn, a Germany based crafter, for example. As you can see, it is meant to be a decorative wall ornament. However, I think it can be scaled down for smaller jewelry designs. The idea could be used for earrings or pendants. Micro-macrame cords will have to be used. The designer also used a number of round rings to find two which fitted her macrame work. This should not be an issue with jewelry makers as you can easily make two wire rings and wrap them together at the top.